How will movies affect toy sales in 2013? What this chart tells us is that the box office in the United States has been pretty flat to slightly declining for years and that International, which had provided growth since 2009, is now also beginning to stall. In reality, given the fact that ticket prices have had a tendency to move up pretty sharply – partly because of inflation and partly because of the introduction of 3-D movies – the chart above would show a much more negative picture if we measured audience numbers. In other words, the primary consumers for children-oriented movies dropped by about one-third in the three years ending in 2011 and my Hollywood contacts tell me that 2012 continued this trend. There is hence a very good reason why more and more toy manufacturers are beginning to shift their license focus to DVD films that bypass cinemas altogether. Mattel’s 2013 offering of Monster High, Max Steel and Planes is a case in point. The first G.I. Joe movie (G.I. Joe: The Rise of Cobra) aired on August 7, 2009, with a box office result world wide of US$ 302 million. Hasbro’s action figure sales resulting from this movie are estimated to have been US$ 130 million worldwide. 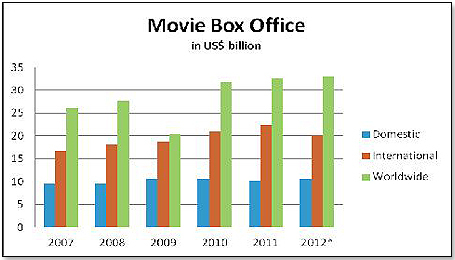 Box Office Mojo projects worldwide box office for G.I. Joe Retaliation at US$ 260 million or 86% of its predecessor. If the box office/sales ratio stays the same as with The Rise of the Cobra, Hasbro can expect to sell US$ 112 million in toys – both action figures and Kre-O. The first Iron Man movie broke on 5/2/08 and yielded worldwide box office sales of US$ 585 million and estimated action figure sales for Hasbro of US$ 130 million. The second movie was released on May 7, 2010, with a worldwide gross of US$ 624 million and estimated action figure sales for Hasbro of US$ 170 million. The Internet Movie Database (IMDb) estimates the domestic box office for Iron Man 3 at US$ 410 million. If the domestic/international split of Iron Man 2 also holds true for Iron Man 3, we look at a box office of US$ 820 million. If the box office/sales ratio stays the same, Hasbro can expect to sell US$ 220 million in toys. Star Trek into Darkness is Hasbro’s first crack at the license, which was previously held by Playmates. The most recent Star Trek movie was released on May 8, 2009, and grossed US$ 385 million worldwide. Playmates had really major problems with the sales for the property in 2009 and attained an estimated at US$ 20 million. IMDb estimates the domestic box office for Star Trek Into Darkness at US$ 330 million. Given the same domestic/international ratio that obtained for the 2009 movie, we are looking at a worldwide box office of about US$ 500 million. There is no question that Hasbro will do a much more effective job with the Star Trek property than what Playmates did and I would estimate that they will reach sales in the neighborhood of about US$ 100 million in action figures and Kre-O. The most recent X-Men movie was X-Men: First Class, released on June 3, 2011, with a worldwide gross of $353 million. Hasbro was the licensee and recorded an estimated worldwide sales number for Action Figures of $ 70 million. IMDb estimates the worldwide box office for The Wolverine at US$ 170 million. At the same domestic/international ratio as the 2011 movie I estimate worldwide box office at US$ 410 million and Hasbro’s toy sales at about US$ 80 million. “The story is of the pilgrimage of a group of seven to a planet called Hyperion. The narrative is set among an environment of chaos with the entire galaxy going to war. This planet too is threatened by war and is characterized by Time Tombs which are large artifacts moving through time. There exists a guardian of these tombs; a horrific monster called the Shrike”. Very little is known about this movie. One negative is that it could be mistaken by the potential audience as a follow-up of the 2011 Immortals which featured the evil King Hyperion – a movie which was characterized by extreme violence and which was “R” rated. The movie Hyperion is based on two novels by Dan Simmons and has been in development for years. There is even some doubt whether the movie will in fact be ready for release this year. Neither Boxoffice.com nor Box Office Mojo feature the title for release this year nor did Rotten Tomatoes have any audience view of this film. The first Thor movie was released on May 6, 2011, and recorded a worldwide box office of US$ 449 million. Hasbro as the master toy licensee had Action Figure sales estimated at US$ 140 million. BOXOFFICE.COM estimates the worldwide box office for the movie at US$ 770 million. Assuming the same box office/product sales ration that obtained for the first Thor movie, we are looking at 240 million for Hasbro. Of all the movies for which Hasbro has the license, the toy buyers think that Thor is likely to do better than generally anticipated and the US$ 240 million figure given above could hence well be on the low side. All six movies are action figure orientated just like Hasbro’s offering last year, which included Spiderman and The Avengers. The combined 2012 box office worldwide of all Hasbro movies was US$ 2,566 million and estimated Hasbro sales for them were US$ 520 million. Not including Hyperion which theoretically could be a second Avatar but whose release in 2013 is in doubt, this year’s five movies combined are estimated to reach a box office world wide of US$ 2,590 million with resulting Hasbro sales of US$ 752 million. Nicolas Cage is the voice of the main character, Grug. The movie reminds one of the 2012 film Ice Age – Continental Drift in terms of genre, the same publisher (Fox) and the quality of animation. This Ice Age movie grossed US$ 875 million and the toy license was also held by Mattel whose toy sales for the title are estimated at US$ 40 million. BOXOFFICE.COM estimates the domestic box office of the Croods movie to be US$ 150 million which is virtually identical to Ice Age’s US$ 161 million, for which international sales reached US$ 875 million. It is the first collaborative effort between Fox and DreamWorks Animation, which argues for the movie to be strongly supported. Early marketing suggests that the film is lacking in the cuteness department, which typically helps draw the attention of younger moviegoers to whom this movie is clearly targeted. Nevertheless, Mattel is not likely to have accepted a license where they did not see a sales volume of at least US$ 50 million. Based on these assumptions I predict a box office for Croods in the area of US$ 800 million and toy sales for Mattel of US$ 80 million. In fact, the toy buyers think that this movie, and the toy range put out by Mattel, could be a real blockbuster. The last Superman movie, Superman Returns, broke on June 28, 2006, with a worldwide gross for the year of US$ 391 million. Mattel had the master toy license for the property and had estimated sales that year of approximately US$ 150 million. IMDb estimates the domestic box office for Man of Steel in the neighborhood of US$ 270 million. Given the same domestic/international ratios that applied to Superman Returns, worldwide box office for the movie is estimated at US$ 530 million. We are hence looking at a possible worldwide sales figure for Mattel in the area of US$ 200 million. Turbo has been made by the makers of Madagascar and Kung Fu Panda and has been likened by my Hollywood friends to Cars 2 both in terms of the thrust of the movie, its animation technique, its box office potential and its targeted audience. Cars 2 was released on 6/24/2011 and had a box office worldwide of US$ 559 million. It also produced sales for Mattel of approximately US$ 320 million. IMDb estimates the domestic box office of Turbo to approximately US$ 145 million. If its domestic/international split is the same as Cars 2, we are looking at a worldwide box office number of US$ 425 million and a sales figure for Mattel of US$ 250 million. The Snow Queen movie – a Christian Andersen adaptation just like Frozen – was featured in 1995 in a film produced by Warner Brothers. No box office results nor any sales numbers for toys produced in conjunction with this film are available. There was also a “Frozen” horror movie released in 2010 that proved to be a total flop (worldwide box office US$ 3 million). My Hollywood friends believe that Frozen has about the same box office potential as Tangled, another Mattel license which had a worldwide box office in 2010 of US$ 590 million and doll sales for Mattel in the vicinity of US$ 80 million. I would hence project the same numbers for Frozen. All four movies have therefore a combined worldwide box office expectation of US$ 2,355 million with resulting Mattel sales of US$ 610 million. This compares with the corresponding figures for 2012 – box office of US$ 3,233 million and Mattel sales from the 2012 movies of approximately US$ 580 million. The Hobbit by Warner for release on 12/13/13, with the toy licensee being Bridge Direct. The first three films are good ones, and the toy licensees very respectable companies, but none is likely to upset the apple cart as far as the mainstream toy space is concerned. The Hobbit, The Desolation of Smaug, is a different story. This movie is likely to be a blockbuster like its predecessor The Hobbit: An Unexpected Journey, which had a box office of US$ 940 million in 2012. However, given its very late screening date in the year, The Hobbit is not very likely to have a major impact in 2013. 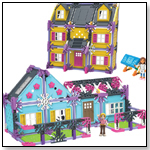 •Preparing For Toy Fair - Tips and Tricks for Retailers! 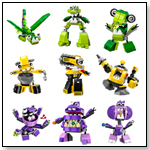 •Preparing For Toy Fair - Tips and Tricks for Manufacturers! •Race to TMI Toymarketing to see NEW Racing Rody!